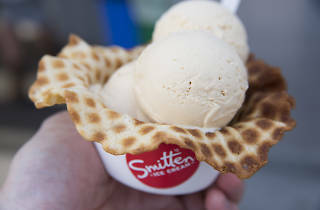 Smitten founder Robyn Sue Fisher is best known for her ingenious Brrr machine, a freezing liquid nitrogen machine that allows her to flash-freeze ice cream to-order, resulting in a delectably silky texture (without emulsifiers). Though she now claims four San Francisco locations, the original shop was set in a humble shipping container off Hayes Valley’s Patricia’s Green. In the six years since opening, the neighborhood has exploded—the shipping container is now surrounded by Biergarten, Blue Bottle, and an outdoor movie theater. 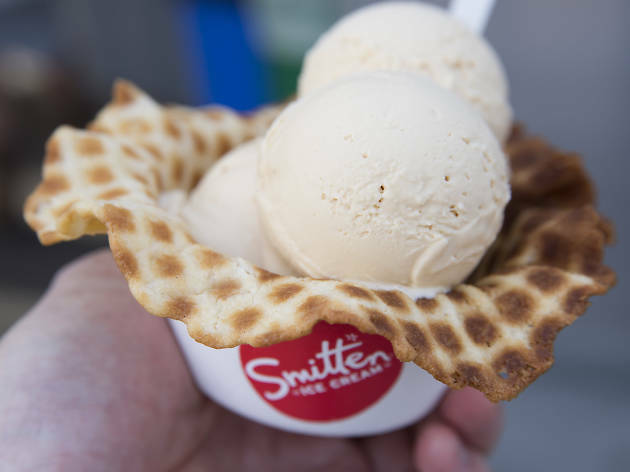 The handmade waffle cones are heaped high with made-to-order ice cream in flavors like cookie dough and pretzels, blueberry lavender, and earl gray and chocolate. Garnish your scoop with exotic toppings like the spicy caramel or strawberry prosecco sauce.